No lie...you have to go home if you don't go big. At least attempt to reach your place of residence, unless...there is a tornado blocking your path. I don't know why God brought me to Colorado, but storm chasing? So then let's picture about 10 cars at one little stop sign. So I get out and take this "beaut" of a pic, then ask the closest person if this is normal. His response, "I don't know. I just moved from Chicago. But I don't know how I feel about the weather out here." Well I'm sure that the feeling becomes a little more distinct as we continue to stare in amazement just waiting for Dorothy to be thrown at us. Then a woman in a car across the intersection barely cracks her window and ask, "Vat 'tis 'dis?" Haha. You mean there is no scientific evidence of tornadoes in Europe? Now unsure if I am more amazed by the tornado or the question I decide it might be best to leave my prayers and presence with the bravest of brave, because Momma ain't raise no fool. 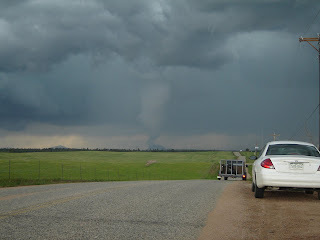 Tornadoes are not toys and though hallucination came to mind, this was not on TV. Fortunately the tornado only uprooted a few trees. 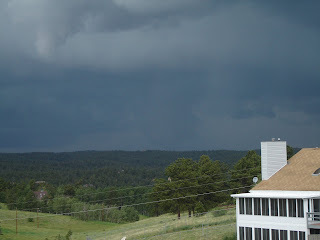 When considering how frightening the sight of a tornado in Divide, CO was, my main thought is how much more amplified must the fright have been for that poor little lady? Well welcome to Colorado. What more could you ask for? 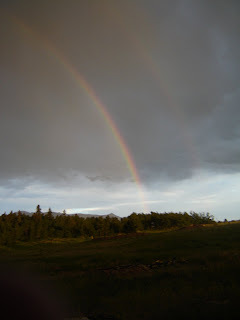 A rainbow?